The right prop on your boat is very important. Different boats, motor sizes and uses should be reflected in the prop on your boat. Dealers sometimes sell you what they have on the shelf and not what is best for your package and specific use. On Dyna-Ski Boats we are not interested in top speed as much as we are about steady speed holding and hole shot for getting skiers out of the water. 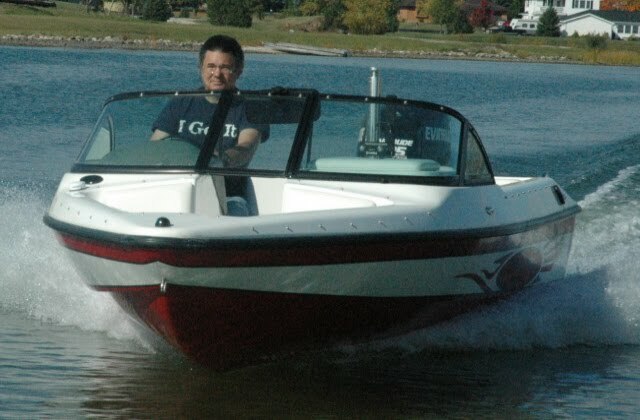 Fishing boat owners and go fast boat owners want top speed. Pontoon owners want a prop that provides the power to move their loads and is economical too. Different brands of engines and even different sizes of engines within a manufacturers line of products often use different prop hubs and different prop sizes. So not all of the many props available can be used on all the engines. When you buy a new or used prop make sure it fits your motor brand, size and year as there are differences. Some dealers will have demo props that you can try. There are many factors that go into prop selection including specific use, engine size (horsepower, number of cylinders and displacement) as well as gear ratio. A word of caution. Props are metal and have sharp edges. They are heavy also. I almost cut a finger off changing a prop while testing props one day and I have changed thousands of props. The engine was not running either. SO BE VERY CAREFUL! Wearing heavy gloves is a good idea also. Props can also be rebuilt (fixed) and some prop repair shops can change the pitch of the prop slightly. Prop shops are not all the same and some are better than others. Generally speaking you get what you pay for so cheaper is often times not as good as new or perhaps as good as another prop shop produces. Ask to see a couple props they have fixed and decide for yourself before you spend your money. A prop can only be fixed a couple times. There are also places that can modify or fine tune a prop for a specific application. It is not cheap and not an exact science. Many things can be done to fine tune a prop including changing the pitch slightly, making the blades smaller, adding holes to create some slip, plugging holes to reduce slip, balancing the prop, etc. Generally speaking this is not something for a do it your selfer. There is usually a part number somewhere on the prop. Many times it is in the center of the mounting hub but sometimes it is on the side of the prop. 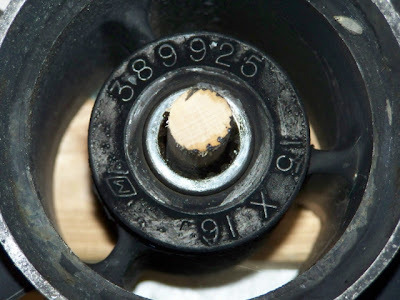 The first number is the diameter in inches and the second is the pitch in inches. The pitch is how far forward in theory that the prop will move the boat forward for one turn of the prop. The first one below has the part number 389925 and size 15" X 16". This prop has a fixed hub and can only be used on a specific brand of engine. It is hanging on a wood dowel on my wooden prop rack. The second one has the size 14 1/2" X 15". 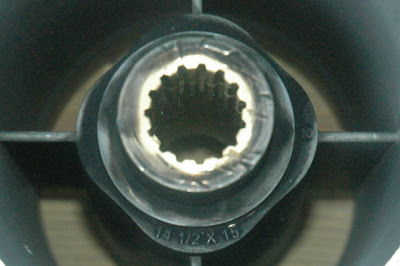 It is a removable center hub so it can be used on different engines with the proper mounting hub. On Dyna-Ski 17.6 Models with a 150 Evinrude E-Tec we have found the four blade 14 1/2" by 15" stainless steel prop to be the best for the application currently readily available. Dyna-Ski 20' Open Bow Models with a 200 HO or larger engine we tend to put a four blade 14 1/2" by 17" stainless steel prop on them unless the user wants additional pulling power then we suggest the four blade 14 1/2" by 15" stainless steel prop. With the four blade 14 1/2" by 15" stainless steel prop the engine will hit the motor rev limiter more easily with light loads. This does not occur as easily with the four blade 14 1/2" by 17" stainless steel prop on the 200 HO to 300 motors. I wish that the motor companies had a better selection of stock "water ski" props for some of their engine models. What I mean by this is a selection of props that increases the pitch one inch at a time. We used to suggest 3 bladed props but these props have been changed over the years so now we suggest mainly four bladed props. A good "water ski" prop needs some slip to help acceleration or boost torque somewhat. I found several interesting videos on You Tube which will give you more information. I'm sure there are many more than these couple. A boat manufacturer and motor manufacturer should be able to guide you in the right direction for your specific application. Enjoy the videos.